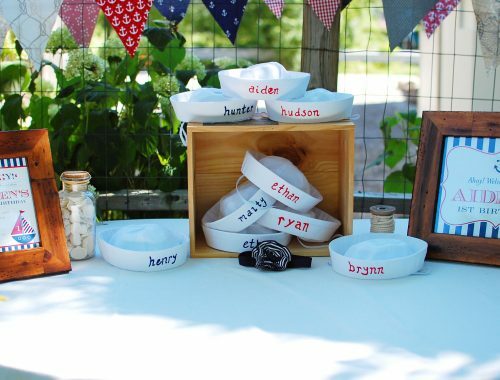 I have always had a not-so-minor obsession with all things nautical – stripes, anchors and sailboats? Yes, please! When my husband and I went to Cape Cod for our first anniversary, I was in heaven. So, naturally, the moment I found out I was having a baby boy when I was pregnant with Aiden, I decided his nursery (and first birthday party) would be nautical themed. Rather than the traditional navy blue and white colour scheme, however, I decided to make things challenging and opted for a more muted and vintage-feeling blue with cream and beige accents (it was not easy finding decor items in that blue colour!). 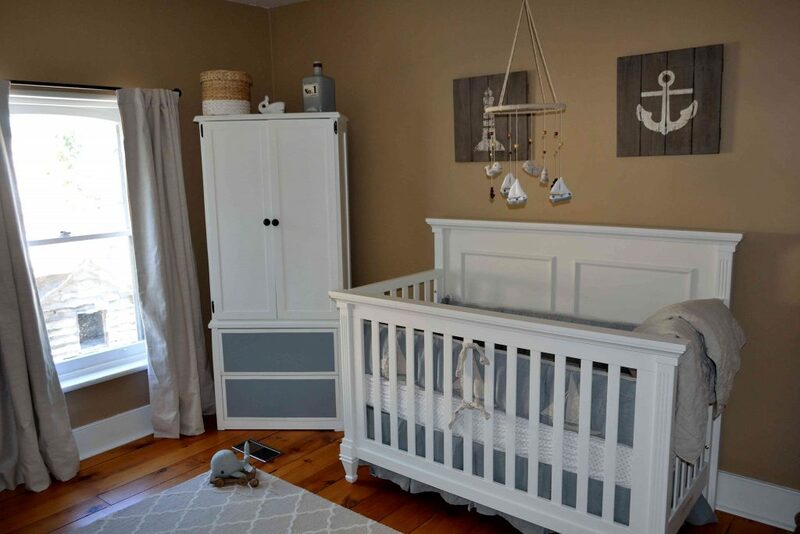 White furniture, black hardware and weathered wood decor pieces completed this vintage nautical nursery! I did a lot of research about baby products before we had Aiden. And I mean a LOT of research. I pretty much researched every single thing we bought (I wish I was exaggerating). After all that research, at the top of my “must have” list was a Greenguard certified crib (and organic mattress); bonus points if it was made in Canada. Enter Natart. Not only are their cribs Greenguard certified, but they are 100% solid wood (and gorgeous). We chose the Belmont crib with the wood panel headboard that can be converted to a bed later on. 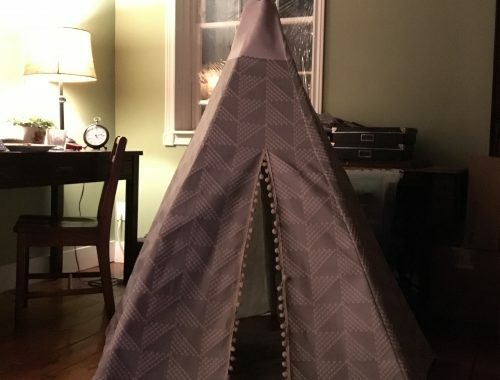 All of the bedding (sailboat bumper, anchor sheets, crib skirt and throw blanket) is from Restoration Hardware Baby & Child, as are the wood pictures above the crib. 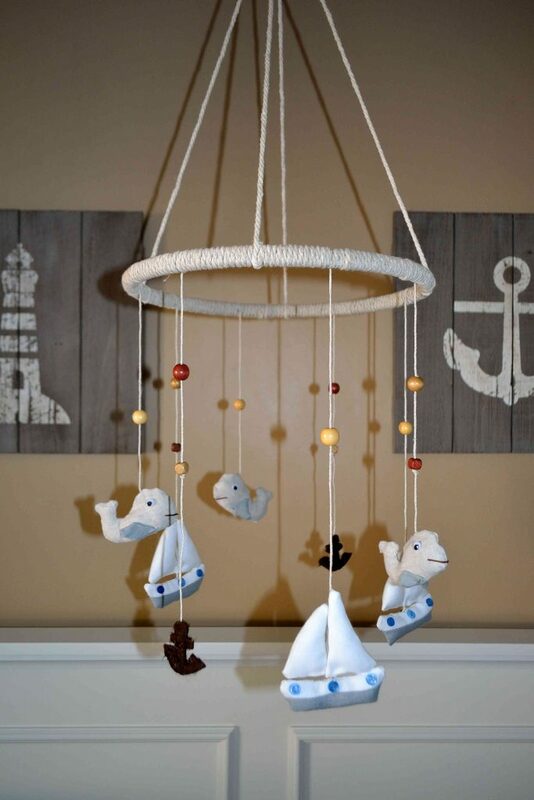 When I first started designing Aiden’s nursery, I decided I wanted to hand make his mobile. I had been sewing and doing DIY crafts for years at that point so it only seemed logical. I had it all planned out in my head and I couldn’t wait to start… little did I realize how difficult it would be hand crafting those incredibly tiny sailboats and whales (the anchors were surprisingly easy). In the end, it was well worth all of the effort as it turned out exactly as I had envisioned! More details about the mobile can be found here. The wardrobe in the corner is a vintage piece my husband and I found at a local antique market. It did not have doors or drawers, and was a medley of different colours, when we bought it. 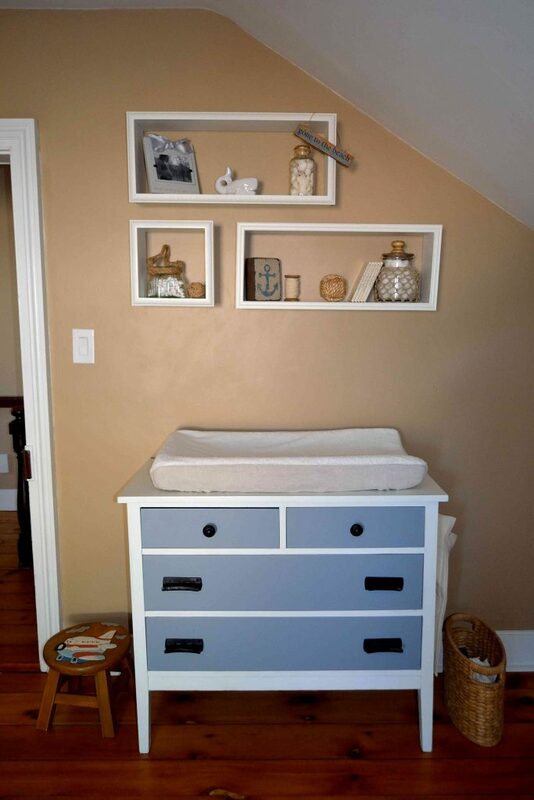 Thankfully, my husband is incredibly handy and he was able to strip it, make custom doors and drawers for it, then paint it white (that we colour matched to the crib) and blue (that we colour matched to the bedding). 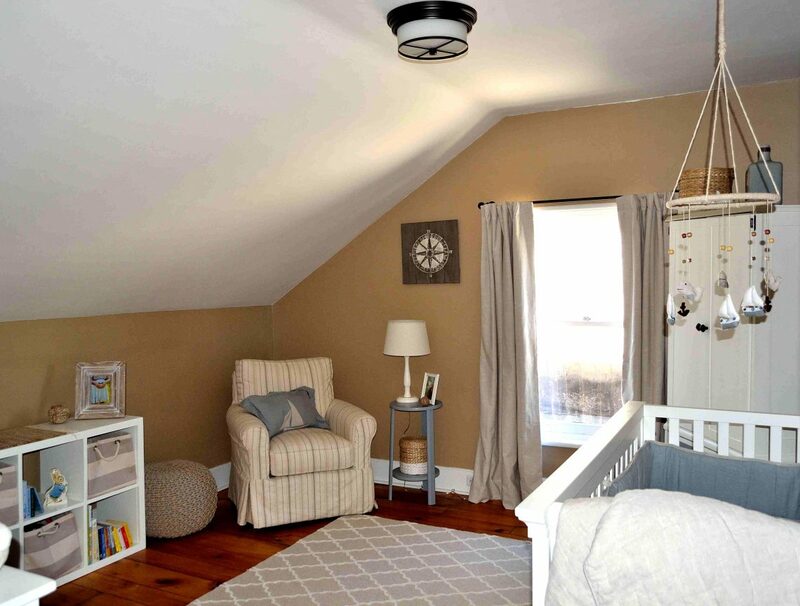 The final product is a perfect-sized wardrobe for a nursery! The area rug and curtains are from Pottery Barn Kids and the small whale toy is from Restoration Hardware Baby & Child. I’m sure by now you are sensing a trend – I am in LOVE with basically everything from Restoration Hardware Baby & Child… just another not-so-minor obsession! Another “must have” item from my baby list was a comfortable nursing chair with a removable slip-cover. I cannot express to you enough how much I love this chair. It is the perfect size and incredibly comfortable! It is from one of my favourite local stores, Accents for Living. Ladies, listen closely: get yourself an amazing nursing chair. You are going to need it! The throw pillow is from Restoration Hardware Baby & Child. The footstool sitting next to the chair is from Urban Barn and the side table lamp is from Pottery Barn Kids; the side table itself is a piece we already owned that my husband stripped and re-painted. The overhead light is from Union Lighting in Toronto. 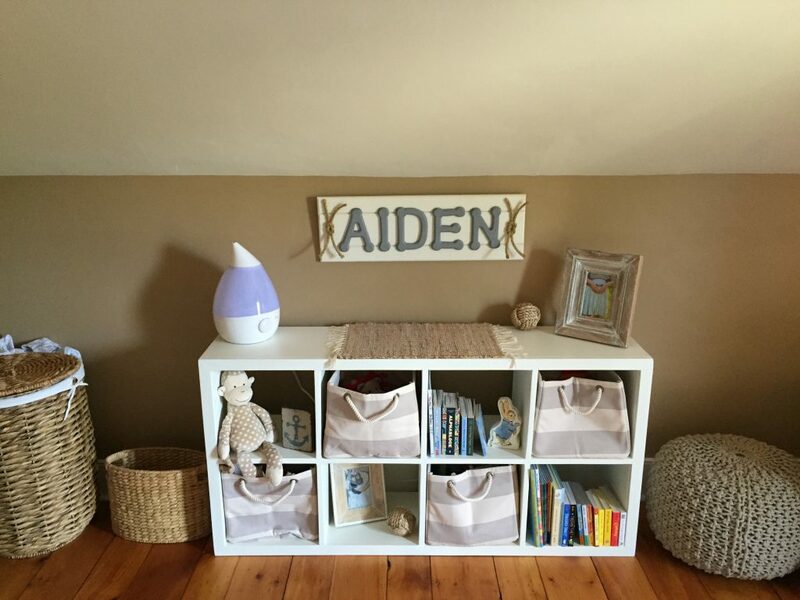 One of my favourite pieces in Aiden’s room is this bookshelf, as simple as it is, because it was completely handmade by my husband. I wanted the look of the IKEA Kallax bookshelf, but I wanted real wood. In case it wasn’t obvious from the pictures, we are fans of real wood furniture around here! This thing is SOLID; it took two people to bring it upstairs! The storage baskets are all from Restoration Hardware Baby & Child. The sign above the shelf was also hand made by my husband. 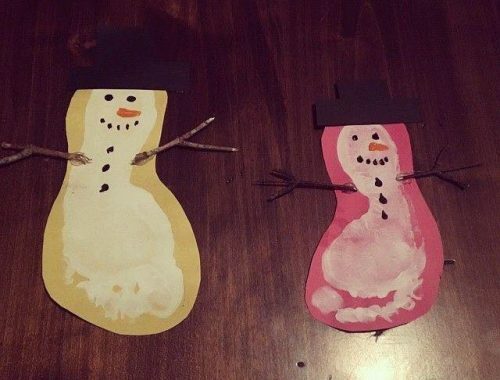 The background boards are shiplap style (one of my favourite styles, of course! ); we found the letters at a local antique market and added some rope for a nautical feel. The dresser is another vintage piece that we picked up at a local antique market for a bargain price; it was also covered in multiple colours when we bought it. After a good sanding, a new paint job and some new hardware, it became the ultimate change table! The hardware is from a great store I found in Muskoka called Simply Cottage. The shelves above the dresser were made by my husband. I had my eye on a very similar set from Restoration Hardware Baby & Child, but they were too large for the area available above the dresser so he kindly agreed to make me my own set (I was 7 months pregnant at that point and desperate to finish decorating the nursery, so he really didn’t have much of a choice!). As you can see, they are a perfect fit! 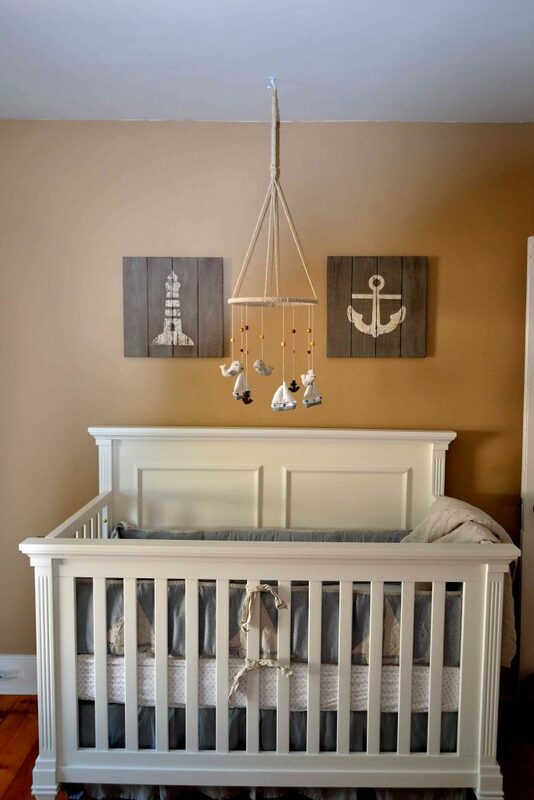 One thing I recall finding very frustrating when I was designing Aiden’s nursery was finding lots of great photos online of other people’s nautical themed nurseries, but not being able to find any details about where everything came from. So, I have tried to include as many details here as I can about where things came from, but if you see something you want to know more about, feel free to leave a comment below!